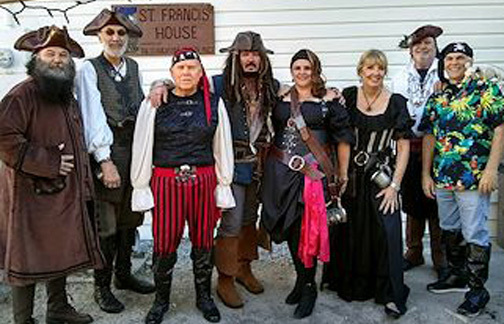 SAINT AUGUSTINE – Kap’n Good’ Karl Kennell and Ye BOGO Buccaneers, love to plan parties for the residents of St. Francis House. On Halloween they dropped anchor with a creepy chili dinner, gifts and candy for all the residents and families. They also invited Krewe of the 13, Inc and magicians Mystic Mel and The Magic of Tom Sisti to add even more flavor. The St. Augustine pirates known as Krewe of the 13, Inc. presented a $2,500. check to St. Francis House. They mingled with the guests as the magicians dazzled everyone with their sleight of hand. The results WERE MAGIC: lots of smiles and good-natured fun! St. Francis House is the only full-time housing crisis center between Jacksonville and Daytona. For more info please visit StFrancisShelter.org.